Christian Bale, Natalie Portman, Melissa Leo and Colin Firth pose with their statuettes. The king ruled at the 83rd Annual Academy Awards last night, an Oscar telecast that I found to be a breezy and relaxed delight. 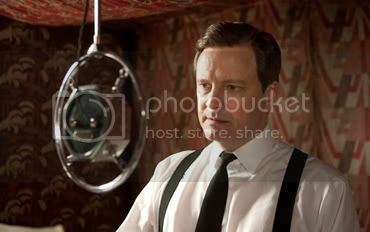 "The King's Speech" won early in the evening for David Seidler in Best Original Screenplay, but it did not take over the evening until the very end with the film winning Best Actor for Colin Firth, Best Director for Tom Hooper and, the final prize, Best Picture as presented by Stephen Spielberg who went on to make a poignant observation: the films that didn't win still rank among some of the very best films in memory. How's that for bursting the "King's Speech" bubble? The Best Picture win, that was expected. Best Actor, of course. Even Best Original Screenplay was a pretty solid win. But that Best Director win is what gets me. Sure I predicted Tom Hooper as taking the prize, but in my heart I was still hoping for David Fincher. It would've created the Best Picture/Best Director split many were predicting, but such was not the case. And while "The King's Speech" won its four awards for Picture, Director, Original Screenplay and Actor, "Inception" had its redemption--for Christopher Nolan's snub, of course--with a tie. Its four wins were all technical winning both Sound Mixing and Editing, Visual Effects and a surprise win over Roger Deakins for "True Grit" in the category of Cinematography. The last one was a deserving win for cinematographer Wally Pfister, though Roger Deakins is still overdue for his Oscar. Following close behind was "The Social Network" with three wins for Best Adapted Screenplay for Aaron Sorkin, Best Score for Trent Reznor and Atticus Ross and Best Editing. Usually the winner of Best Editing goes on to win Best Picture. Yeah, but not when it loses the Best Director race. Behind "The Social Network" was "The Fighter," "Toy Story 3" and "Alice in Wonderland" all tied with two. As for our hosts, I was pleased. Anne Hathaway and James Franco kicked things off with a tribute to a few of the films nominated for Best Picture, Alec Baldwin and Morgan Freeman cameos included. It was a hilarious start to a not as hilarious opening monologue that consisted of shout-outs to Franco's grandmother and Hathaway's mom. It oozed just a tad too much cuteness but was nicely offset by Hathaway announcing, "It was a great year for lesbians!" While they weren't as funny or charming as I had anticipated--or as presented by their opening bit--Hathaway and Franco still delivered and did a commendable job. Hathaway probably could have hosted by herself as Franco wasn't providing much support as it seemed he was channeling his character from "Pineapple Express" most of the time; yeah, he acted high. Hathaway made up for it with her radiance and smiling personality which turned into a few too many giggling fits, but who can blame her? She was clearly psyched about hosting. More than Franco, at least, who instead was scripted to make a crack about his nomination--and Hathaway's lack of one--during their opening monologue. Franco also appeared in drag at one point while Hathaway got to sing a humorous solo bashing actor Hugh Jackman. But, best of all? Right at the start they joked about why they were selected to host in the first place: they're young and hip! According to the ratings, the academy will not be going this path again. Better with sticking to what they know, but even so, a bold choice for this year. The stage looked nice, especially when it was lit up with scenes and sets from movies past. This was showcased during the technical award presentations which were each preceded with a bit of a history lesson about the Oscars. This history lesson then got ramped up a notch when Billy Crystal made a surprise appearance about halfway through the show--receiving a standing ovation--and talked about previous host Bob Hope who then appeared in a strange beyond the grave holograph image addressing the audience. This wasn't quite as strange, though, as the musical selection of "Smile" for Celine Dion to sing during the In Memoriam montage. What was there to smile about? In terms of the awards, the night actually hinted at unpredictability at first with a win for "Alice in Wonderland" over "The King's Speech" in Art Direction and the Cinematography win for "Inception" over "True Grit." Such predictability faded instantly, though, once the other awards got underway. Hailee Steinfeld of "True Grit" failed to upset as Melissa Leo of "The Fighter" won for Best Supporting Actress. The award was presented by Kirk Douglas whose speech was slurred due to his stroke but still managed to receive perhaps more laughs than even our hosts by delaying reading the winner. Leo then proceeded to have the flat-out most exuberant acceptance speech of the evening to the point of her accidentally letting a nearly uncensored F-bomb fly. Shortly following this was a win for Leo's "Fighter" co-star Christian Bale who, as expected, took Best Supporting Actor. He made a quip about Leo's F-bomb but also said he's dropped a few of those himself in the past. Well, I'm sure he has. I thought Aaron Sorkin would have one of the better speeches for his Best Adapted Screenplay win, but he was bizarrely played off early by the orchestra and therefore overshadowed by David Seilder for Best Original Screenplay who made a kindhearted note about stutterers everywhere who indeed have a voice. Likewise, Hooper's win for Director provided us with a nice anecdote about his mother. "Inside Job" won Best Documentary over "Exit Through the Gift Shop," though Justin Timberlake--during his presenting bit with Mila Kunis--jokingly claimed he was the famed British graffiti artist, Banksy. "Toy Story 3" inevitably won Best Animated Feature while Denmark's "In a Better World" won Best Foreign Film, a win that might be considered an upset but who really knows about that category anymore. After announcing the Best Makeup nominees, the last one being "The Wolfman," presenter Cate Blanchett flatly stated "that's gross" before announcing the winner. That movie winning an Academy Award? Gross indeed. Not nearly as gross, though, as "Alice in Wonderland" winning two awards for Best Costume and Art Direction. There was unexpected excitement in one of the shorts categories as the winner of Best Live Action Short turned out to be a graduate student of the NYU film program who wish he had gotten a haircut. Later in the evening, Franco noted that it was the year of the movie musical. Hathaway reminded him it certainly wasn't, but alas, we were then shown scenes from last year's movies auto-tuned into songs. A ridiculous moment, sure, but I thought it was an amusing bit. I also welcomed the return of the Best Song performances after their absence last year along with a live orchestra playing each Best Score nominee. The night's best speeches fittingly came at the end. Jeff Bridges introduced each Best Actress nominee while appearing to just be hitting on them, which led to Natalie Portman's win for "Black Swan." Her speech was wonderfully teary-eyed and her walk to the stage created the loudest and warmest audience reaction. Sandra Bullock then gave funny introductions to each Best Actor nominee, and Colin Firth's speech for his "King's Speech" win charmed while he held back his urge to dance. The night consisted of two lovely Best Picture nominee montages even though the second one, which preceded the announcement of Best Picture, was set to King George VI's speech from "The King's Speech" and became too obvious in essentially narrating the film's own win considering how that award turned out. The first montage opened the show playing to the rendition of "In the Hall of the Mountain King" from "The Social Network," a nice touch. Closing the show was a random but nonetheless rather moving PS-22 Staten Island Chorus singing "Over the Rainbow" with all the night's winners walking forward to meet them on stage and join in singing. From what I'm understanding, many considered last night's Oscar telecast to be awful, especially Roger Ebert who tweeted it was the worst he'd ever seen. I thought it was fine, and I was entertained. It may not have been the liveliest I've seen, but it was pleasant and, as for the awards, there was a nice spread of the honor. Best yet, it clipped along at a reasonable pace clocking in at just under the 3-and-a-half hour mark. I'm just glad this lengthy awards season is finally at its end. It was an interesting one and a backslide for the academy in awarding "The King's Speech" over "The Social Network." Last night undid everything the win for "Crash" had done since 2005. It's now as if the wins for "No Country for Old Men" and "The Hurt Locker" never existed during the academy's brief period of lining up with the critics. But enough about the Oscars; here's to the coming year in film. Let's get started. Of the 21 categories I predicted, I got 19 of them correct. We're just one more week away, folks. It's come down to the nerd vs. the king. Who's going to come out on top? Well, looks like all sights are now set on "The King's Speech" because the academy is ready to lean back toward the more crowd-pleasing selection as it's been steering away from that in recent years. Best Picture: "The King's Speech" -- is a "Social Network" upset still a possibility? In my mind, yes, but unlikely. Director: He did receive the DGA, so I'm sticking with Tom Hooper for "The King's Speech," though David Fincher literally won every other award. Best Actor: Colin Firth for "The King's Speech," no question. Best Actress: Though some are still saying Annette Bening has some remaining strength over Natalie Portman, I'm going with the latter for "Black Swan." Best Supporting Actor: Does "The King's Speech" have enough draw to bring Geoffrey Rush in for a win here? I don't think so. Christian Bale for "The Fighter" will take this one. Best Supporting Actress: I'm going with Melissa Leo for "The Fighter," though Hailee Steinfeld in "True Grit" for the upset is looking more and more to be a possibility. Animated Feature: "Toy Story 3"
Best Original Screenplay: David Seidler for "The King's Speech"
Best Adapted Screenplay: Aaron Sorkin for "The Social Network"
Sound Editing: Let's go with "Inception" here. It has a booming sound. Sound Mixing: "Inception" for the same reason as above. Film Editing: "The Social Network" has this even though usually the film that wins this award goes on to win Best Picture. Not the case this year, turns out. Documentary Feature: "Inside Job," though "Exit Through the Gift Shop" and "Restrepo" are both possibilities. Seems like my choice is the timeliest, though. Foreign Language Film: Hard to say, but I'm going with Denmark's "In a Better World" as it won the Golden Globe. Cinematography: Roger Deakins for "True Grit" because he's gone too far with too many nominations without finally taking home an Oscar. Makeup: Let's go with "The Wolfman" because--even better than aging people--they turned a man into a wolf. Costume Design: "Alice in Wonderland" really did have the most outlandish and creative costumes of any movie this year. Visual Effects: "Inception"--what else would win? Original Song: That final song in "Toy Story 3," "We Belong Together," really hit a chord with the entire series. It should and will win. Original Score: Trent Reznor and Atticus Ross for "The Social Network"
Art Direction: "The King's Speech" probably has this one for being such a nicely done period piece. Tune in to ABC on February 27 at 8 p.m. to catch the 83rd Annual Academy Award ceremony to find out how correct your own predictions turn out to be! Today's announcement of the 2011 BAFTA winners continued the reign of "The King's Speech" in this final stretch of the awards season. It makes sense, though. A grandly British film received the top awards winning not only Best Film but Outstanding British Film, as well, from the British Film Academy nonetheless. When "Speech" took Outstanding British Film over the likes of "127 Hours" and "Another Year," I began thinking maybe "The Social Network" could win Best Film because I honestly didn't think "Speech" would take both. But alas, it did. The surprise came with a Best Director win for David Fincher over Tom Hooper. Does this have any effect on the Oscar outcome, however? As much as I would like to hope so, I think Tom Hooper's DGA win still locks in his Oscar win even though he did not receive the BAFTA win. 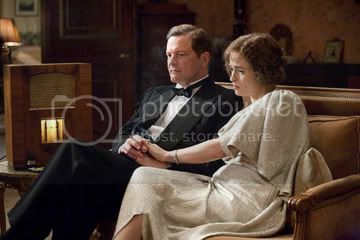 "The King's Speech" also dominated the acting awards aside from Natalie Portman in "Black Swan" for Best Actress. Colin Firth's win for Best Actor will go on to an Oscar win, but I'm having a hard time believing Geoffrey Rush for Best Supporting Actor and Helena Bonham Carter for Best Supporting Actress are going to make an upset over the "Fighter" front-runners of Christian Bale and Melissa Leo. "True Grit" received some love for Best Cinematography, a win I think will be repeated at the Oscars. It's about time Roger Deakins gets an Oscar after his many, many nominations. The "Harry Potter" films received a nice, worthy honor for Outstanding British Contribution to Cinema. I mean, with a total of eight films all of rather high quality--that's an accomplishment in itself. Full list of the 2011 BAFTA winners. And we're just two weeks away from the 83rd Annual Academy Awards! Until then, everybody.